Fiber stack of the CubeZero detector. The identification of particles, and especially antiprotons, within the AFIS detector relies upon a unique detection principle which has not been been used in any other experiment until today. While extensive computer simulations using well-known software packages can in principle show whether a detector is likely going to work or not, they can in no way replace a proof-of-principle hardware test examining the actual detector response. For AFIS, the proof-of-principle experiment is called CubeZero and was conducted throughout 2013, with the final beam test at Paul Scherrer Institute taking place in early December. 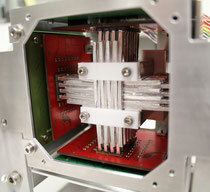 CubeZero is a down-scaled version of the AFIS detector with just 128 instead of 900 channels. 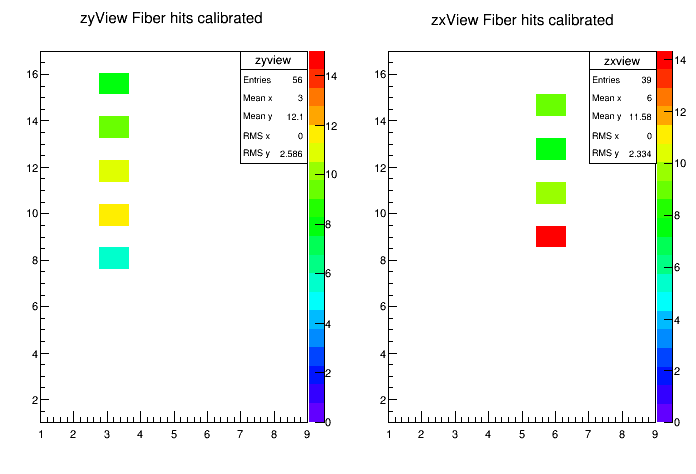 Since CubeZero was designed for tests in a particle beam at an accelerator facility its fibers are arranged in 16 layers of 8 fibers each, instead of a cubic architecture. Also, the detector was not designed accordig to the requirements and constraints of the space mission. 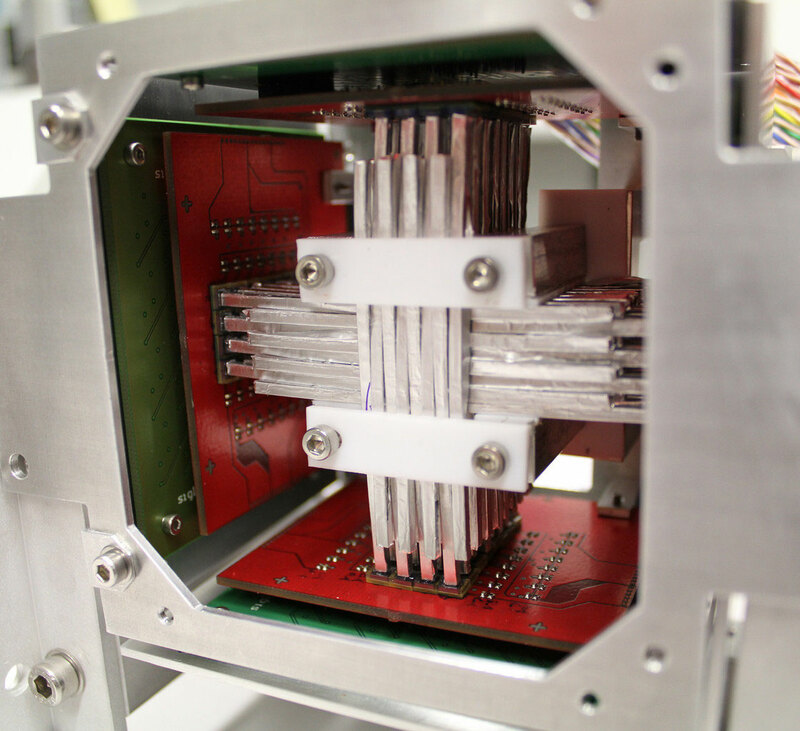 CubeZero was constructed in order to test the detector's capability to track charged particles in the minimum ionizing regime, such as pions and muons. The ability to do this is of importance because the principle of identifying antiprotons relies on it. Additionally, the characteristic signal of protons stopping within the detector's active volume is the main focus of the data anlysis currently conducted. 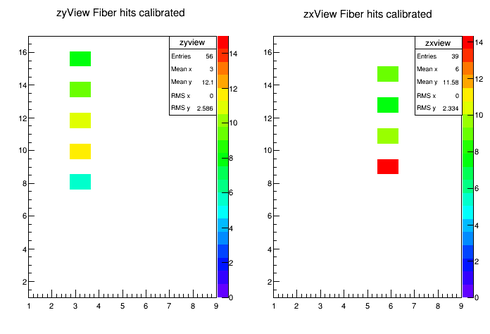 First results are already available, showing that the detectors is indeed able to track miminum ionizing particles. Also, a qualitative analysis shows that stopping protons can be identified as well. This image shows a 50 MeV proton stopping within CubeZero's active detector volume. The two graphs show the x- and y-projections of the read-out channels. The proton enters from the top, stopping about halfway through the detector.